So I’m shopping at my favorite boutique (what, you don’t know which one?) and I come across this waitress pouch. Next thing I realize, I’m at the check-out desk and I’m buying it without really knowing why. Now that I’ve got it though it’s all becoming clear. 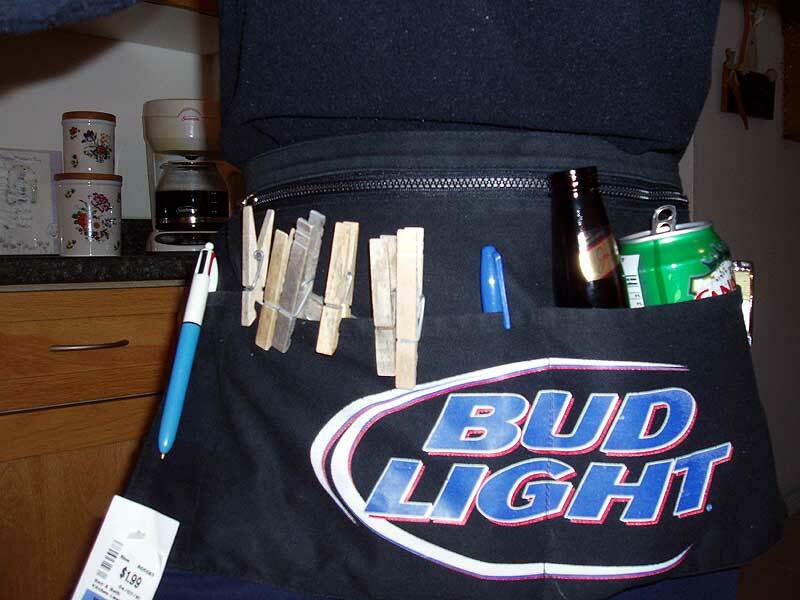 This pouch does it all. Really! I bought it for convenience while hanging out the laundry, no more reaching in the clothes peg bag which is usually ten feet away down the line and twisting in the wind. Now I just pick up the clothes from the basket and reach into my pouch at the same time for the clothes pegs. How convenient is that? Hubby thinks this is great, too. Why you ask? Well, because it can carry beer to your thirsty husband after he has cut the acreage, rotilled the garden, limed the lawn and is getting ready to BBQ dinner. I may not be a waitress for a day or ever but I guess I can bring him a beer. I better get a good tip, though. Don’t you think? One of my pet peeves is to be one place in the house and what I need is in the other--This would work just dandy to take care of that!! By the way, my comment about your new grill must have hit a glitch on blogger because it's not there--So I'll just tell you I LOVE the new addition to your household!! There's nothing like burgers on the grill!! Sorry we missed your earlier comment. We've used the new grill almost everyday since we got it. You gotta love BBQ season. I was a waitress for many years, and yes, those pouches are handy! At Christmas, we sometimes exchange small gifts with an older couple whose older son grew up with DH. They are practical people, and gifted us one year with a clothespin bag that has a shoulder sling. Yep, around my neck it goes, and the bag comes with me! It's really starting to wear now, and i'm going to make another bag just like it when the time comes. So, so handy! And yes, if you're serving hubby a refreshing beverage to assuage his thirst, he'd be wise to give you a good tip! That's my favorite style of apron when I'm working ( but the wrong beer brand). Actually I think I may see f there's any spare aprons at work! I loved the beer and ginger ale tucked into the pocket, but change the beer to Keith's or Rickard's and the ginger ale to Sussex golden ginger ale and I'd be a happy girl! Sorry only Clancy's for Hubby and as for Me I haven't found a beer I like. I'm not a big fan of carbonated beverages so I guess that's the big issue when I order a Beer. Red Wine is my choice of poison. Why is this your favorite style of apron? That clothes pin bag sounds very different but practical. I've never heard of it and would love to see a picture of this style. Maybe you should keep it a secret and patent it. This is my favorite type of apron because it has a plastic clip to keep it on, ( no struggling with strings if you need the bathroom), the three front pockets are used for order pads ( if you use them, i normally don't unless its a big table), a bill fold to hold receipts and cash, a change purse to hold my float, one pocket can stash Personal hygiene products, lip balm, etc. The two small one hold your pens. The part with the zipper, that one is good if you've had a lot of cash payments, as place to stash the cash so you don;t lose any. Thanks for the great info on the apron much appreciated. What a GREAT idea...I know exactly how it is to have to run back and forth while doing my housework...I think I'm going to get one of these..!!! !